Most certainly! All transactions are securely encrypted using the latest industry technology. You can feel confident that your individual information will be protected when you access your account and your financial information stays safe and is never seen by your property manager. If you have a checking account, you can pay by rent online. 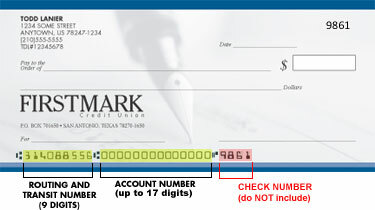 An electronic check, or eCheck, is an electronic version of a paper check, used to process a payment online. To make a payment for rent or other expenses by eCheck, renters simply provide their checking account and routing numbers(example below). Upon payment, the funds are directly debited from the renter’s checking account and deposits the funds directly into the property’s bank account. **Please note, with an electronic check, your payment may be returned ‘NSF’ if you have insufficient funds in your account. Do we sell or provide your personal information to other companies? Abosolutely not! We do not sell individual information obtained online about our visitors. And, we will not disclose the individual information provided to us online to anyone outside of PayClix unless you specifically authorize it, it is required by law, or disclosure is necessary to protect the safety of customers, employees or property.